News Best wishes for a Happy New Year! 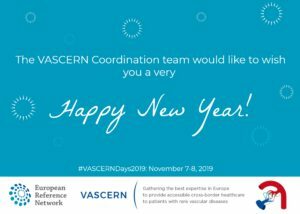 The VASCERN Coordination team would like to wish you all a very happy, healthy and prosperous 2019! We look forward to the year ahead and achieving many more of our goals, which will improve the lives of patients with rare vascular diseases. European Joint Programme on Rare Diseases (EJP RD) call and website online!